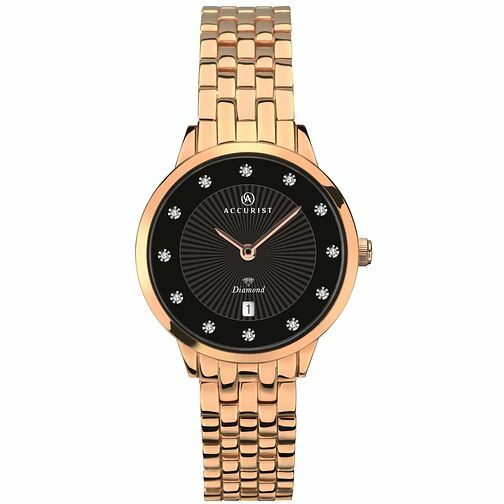 This Accurist ladies' watch features rose gold plated case and bracelet, black sunray dial with diamonds, and a date display, giving you the perfect mix of style and function. Accurist Ladies' Rose Gold Plated Steel Bracelet Watch is rated 5.0 out of 5 by 2. Rated 5 out of 5 by Anonymous from Exclusive buy When I saw this watch I just loved it and spare no time to buy! Luckily this expensive piece was on sale then. It was a present for sister in law and she was more than happy. Her colleagues admires a lot that she confirms me. Its really an excellent piece of collection with magnificent, smart and classy out look. I wish to buy another one for myself. Rated 5 out of 5 by Anonymous from beautiful appearance, ellegant look when out for dinner. Have been buying watches from you since long. Liked ourselves , family and friends to whom we gifted these watches (from republic of ireland,dublin, london and glasgow.). accurist ,rotary watches are longlosting , have no any issues of being damaged. batterys can work for more than 2 years.i prefer to buy watches for birthdays, wedding anniversies in family and family friends every year when i go back home.